September 20, 2014 ARTLab: Destroy This! 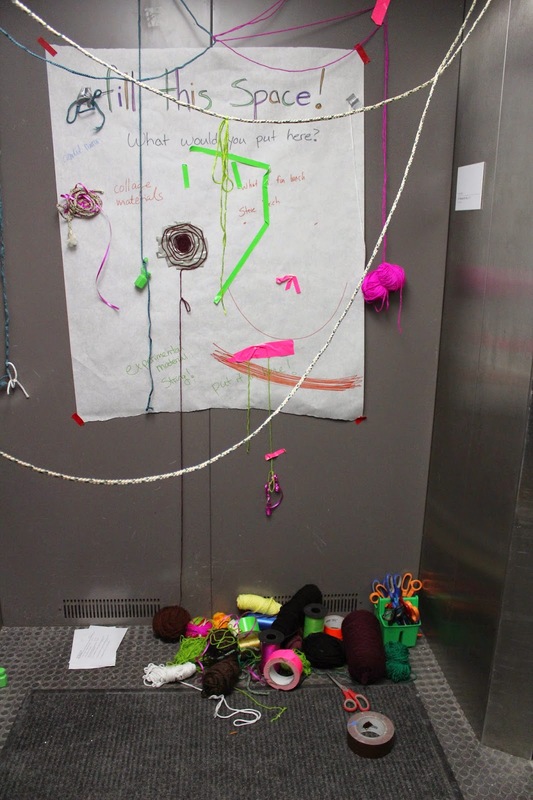 Our last ARTLab, Fill This Space!, included bubbles, projectors, and yarn. I think everyone had fun, because how often do you get to play with bubbles in a museum, or a real overhead projector? I think people should carry bubbles with them wherever they go. During this week’s ARTLab, I want you to experience the joy (or perhaps anxiety) of defacing and destroying an object in an artistic way. We’ll be subtracting instead of adding! He calls this type of drawing a Wall Removal. When I look at it, I think about the ways we make art. 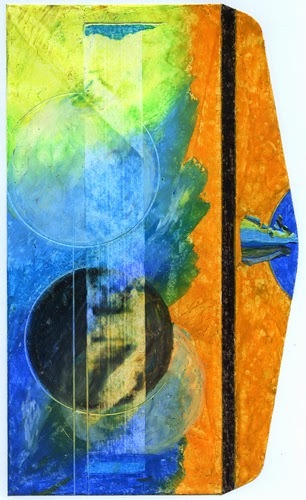 The artmaking process can include addition or subtraction. When we add, we may be adding a pencil line to a piece of paper, a paint stroke to a canvas, or gluing a googly eye to a paper bag puppet. When we subtract, we may be whittling a piece of wood, we may be carving linoleum to make a block print, or, we may even be adding and subtracting simultaneously when we play with a big blob of clay. Those are all safe artistic mediums that we expect to consume and use for an artistic purpose. When you start to intentionally mark up or scratch into something that is whole and perfect, how do you feel about that? Is it art? Let’s find out this weekend! As always, ARTLab is free with museum admission, and is open to all ages, kids and adults! In addition, this Saturday will include our very first drop-in tour at noon! 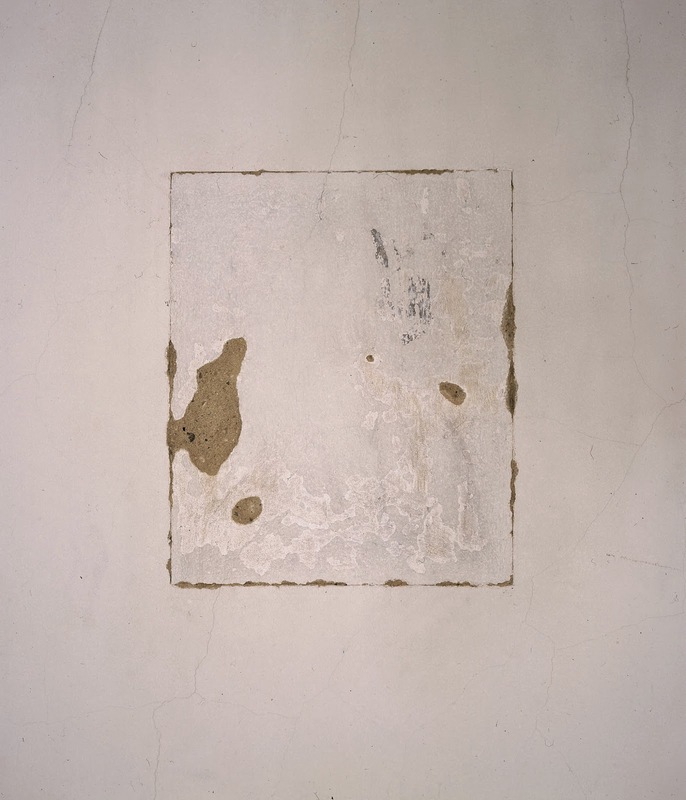 We’ll visit William Anastasi’s work in addition to Kathleen Montgomery’s new installation over at 1414 Monterey, and then we’ll head back to the main building lobby for ARTLab! ARTLab programs are open to all ages and are FREE with museum admission! The MF ArtMarket Is Coming! Visit the Mattress Factory on Saturday, September 27, 2014, for one of our favorite events! From 10am to 5pm, find art outside the box! The MF ArtMarket, a pop-up art market featuring uncommon items from independent artists and designers, will fill the Mattress Factory lobby and Winifred Lutz Garden spaces. Unique wares, crafts, and fine art will be available at a variety of price points — and Pittsburgh’s celebrated Mac & Gold food truck will be stationed at the museum throughout the day, providing delicious comfort food for purchase. Join us! Di-ay Battad is a multidisciplinary artist who gravitates toward things that move and mutate. Through appropriation, animation, and collage, Di-ay's work explores the tendencies of personal, cultural, and digital memory to construct experiences and meaning. Her latest 2D works incorporate images taken by her mother in the Philippines, New England, and Pennsylvania, and refer to to her previous homes, her connections with them, and their rapidly changing landscapes and ecologies. Her latest abstract video pieces contemplate a wide range of things that might be invisible. Featured at the MF ArtMarket // Giclée prints, animation stills on photo paper, screen prints, and original pen and ink drawings ($—$$$; most items $). Julia Betts investigates the idea of transience and self through choices in material and process. Impermanent materials such as scotch tape, digital images, and string act as surrogate for the body. In her work, the materials go through stages of accretion, removal, and regeneration through both physical intervention and natural degradation. Featured at the MF ArtMarket // 1” x 1” physical objects, cards, posters, and 13” x 19” framed prints ($—$$; most items $). Reflecting skills across a full range of communication channels from print to digital to multimedia visual and experiential art, Terese Jungle’s work is built upon a foundation of consciousness of the many ways people receive and process messages, from written word, to form, color, sound, light, tone, and intent. She is currently focusing on pen and ink drawings, mostly line art, some with minimal color; most are conceptual and focused on some form of psychological or spiritual growth work. 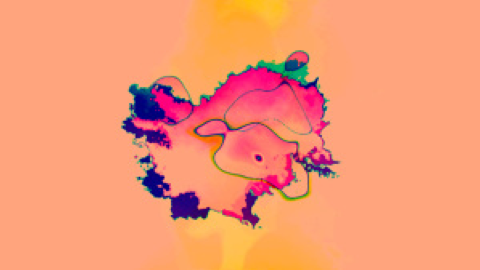 Further, she is presently developing some digital pieces using text and minimal color. Featured at the MF ArtMarket // Prints, cards, and books ($—$$). Kyla Kemmerer is a recent graduate of Pratt Institute in Brooklyn, NY, and is currently working as an illustrator in Pittsburgh. 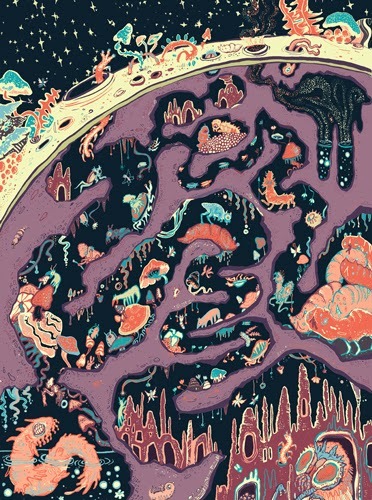 Her work usually consists of strange creatures, bright colors, and dark or silly subject matter. Featured at the MF ArtMarket // Prints and posters ($—$$). Brian Lang has lived in Pittsburgh since 1986 and is currently curator of BNY Mellon’s art collection. He also serves on the boards of Silver Eye Center for Photography and Citizens for Pennsylvania's Future. Brian has been making abstract drawings on envelopes for over 20 years. 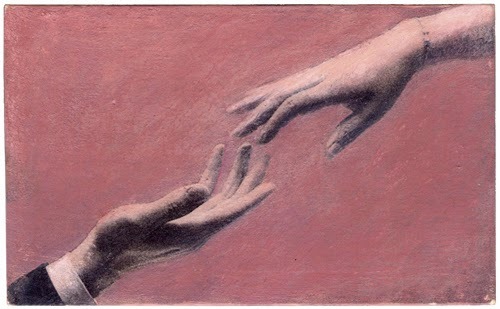 All of his drawings are oil pastel/mixed media on business envelopes and roughly 4” x 9.5”. Featured at the MF ArtMarket // Drawings ($$$). Jennifer Rockage McGhee is an artist living and working in Pittsburgh. 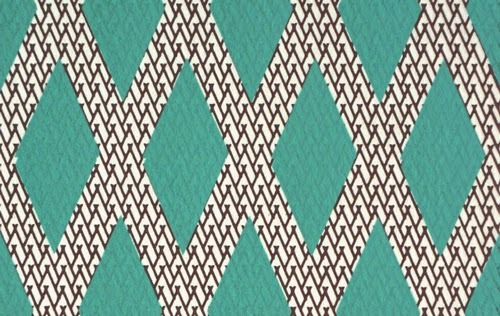 The fabric and prints she creates are inspired by her love for design, text, color, and texture. She received a BFA in printmaking and graphic design from Clarion University of Pennsylvania and a MFA from West Virginia University. Featured at the MF ArtMarket // Prints, fabric, and pillows ($—$$). At the MF ArtMarket, she is offering usable art pieces for coffee tables and countertops, which can be used as coasters or hot plates. Her hot plates can be hung on the wall or simply placed vertically on a countertop as decorative pieces when not in use. She is also offering some pieces that are simply wall hangings. Celeste’s work features photo transfers of hands with metallic paint and leafing. They are all hands in various gestures of communication. Some are there to serve, some are praying, some are connecting, greeting, or touching. Each piece is unique, as the process she uses for transferring the photos is unpredictable, and she uses different surface textures — wood, cardboard, ceramic tile, slate, and cork. Featured at the MF ArtMarket // Coasters (in sets of 4), hot plates, and wall art ($$—$$$$). Ben Pyles was born and raised in Pittsburgh, and he is a teacher at the Manchester Craftsmen's Guild. He has always loved drawing cartoons and monsters. 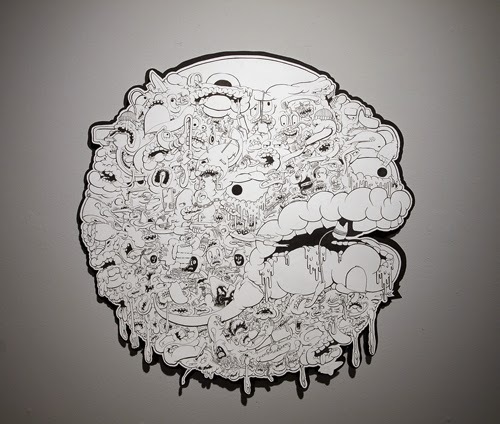 Heavily inspired by cartoons from his childhood, a lot of his work revolves around cartoon violence. He is attracted to gross and violent imagery and how, in cartoon form, it can be funny and entertaining. If he can get someone to laugh or smile at one of his works, then he considers it a success! Featured at the MF ArtMarket // Small to medium screen prints, works on wood, and some larger art prints ($$—$$$$). Todd Sanders is a graphic designer, translator, furniture maker, and book artist living in Pittsburgh. He founded his studio, FMS & Sons Woodworking, to pursue an interest in building furniture, often with reclaimed or unwanted wood, as well as small utilitarian items. His publishing house, Air and Nothingness Press, grew out of a desire to create quality, limited editions of poetry in translation and has grown to include both his own work in poetry as well as expressions in livre d’artiste, also known as artist books. He began seriously designing books in 1999 when he started translating the surrealist poetry of Robert Desnos out of a desire to share Desnos’ work with a wider public in the United States. Air and Nothingness Press then expanded after he was introduced to the concept of artist books through the work of Keith Smith, Julie Chen, Laurie Anderson, and Jost Hochuli. He now actively creates artist books with his own writing and illustrations as well as texts by other authors he admires, creating artifacts of the worlds within those stories. Unlike some book artists, he feels it is of primary importance for an artist book to have a narrative structure. This can take different forms but a serial experience is a necessary one for his own artistic expression. His artist books have lately expanded their forms to include woodworking and furniture elements, as well as a curatorial narrative, which acts to provide a second or third layer of meaning to the pieces. Featured at the MF ArtMarket // Artist books ($$—$$$$). 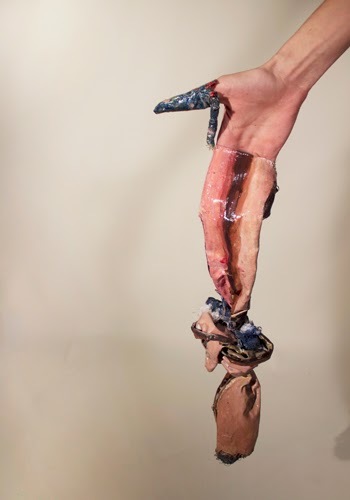 Katie Schutte received a BFA from Kent State University in 2006 and a MFA from Miami University in 2011. While at Miami, she taught jewelry and metalsmithing courses to students from various majors and received several grants and awards. Her work has been exhibited in the United States and Spain. 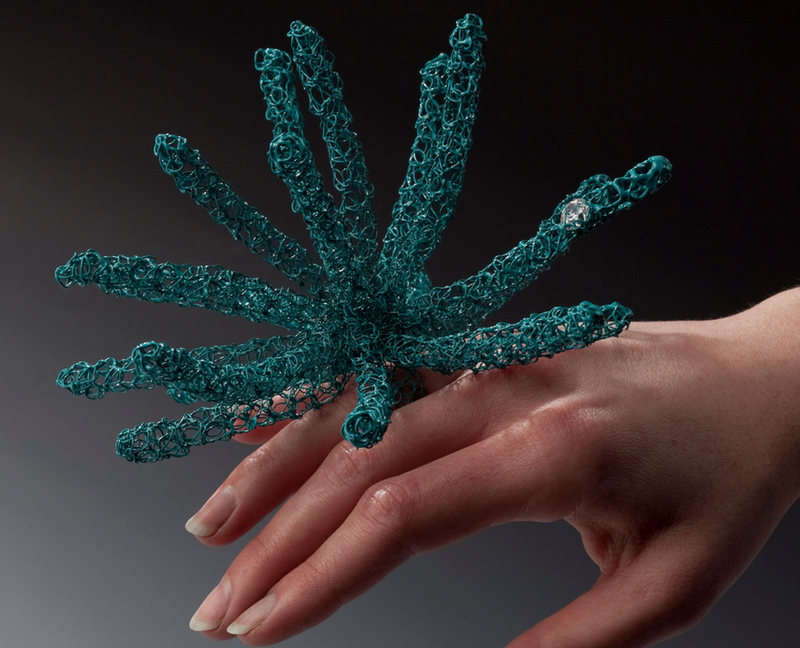 She is interested in utilizing crochet, which tends to be viewed as feminine craft, as a method for working with materials and in fine arts disciplines historically seen as masculine. Featured at the MF ArtMarket // Jewelry, accessories, and ornaments ($—$$$$). Recently Kate Stevens has enjoyed transforming bits and pieces of her preexisting artwork through collage. 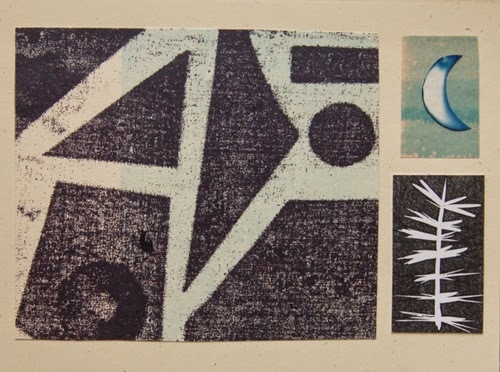 She uses her alternative process photographs, alongside letterpress prints, hand-drawn and painted elements, and found paper, to make new works. Featured at the MF ArtMarket // One of a kind cards with envelopes, framed art, and mini canvases ($—$$). Nathan Lorenzo will be live-streaming video work throughout the day. Nathan was born and raised in Gettysburg, PA. He graduated with a Bachelor of Science in Graphic Design from the Art Institute of Pittsburgh in 2007. He currently lives and works in Pittsburgh. Di-ay Battad will be showing animation work while stills from her animations are on sale at the ArtMarket. Di-ay is a multidisciplinary artist who gravitates toward things that move and mutate. 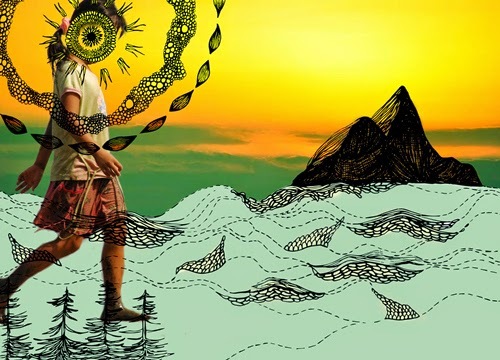 Through appropriation, animation, and collage, her work explores the tendencies of personal, cultural, and digital memory to construct experiences and meaning. 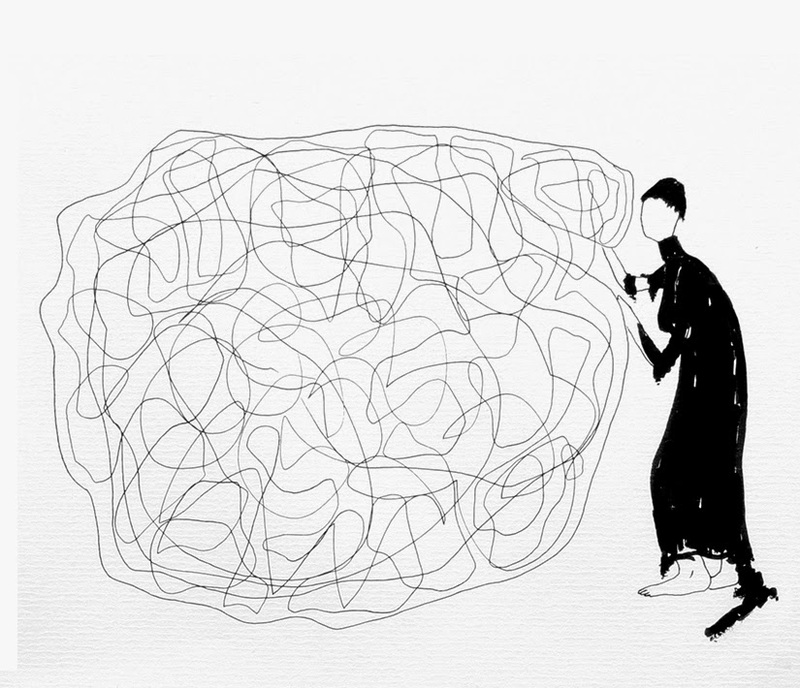 Her latest abstract video pieces contemplate a wide range of things that might be invisible. 412.231.3169 or shop [at] mattress [dot] org. sam [at] mattress [dot] org. September 6, 2014 ArtLab: Fill this Space! Last month on August 2, we had visitors fill the elevator with balloons! And on August 16, Penny Arcade Comedy filled the galleries with improv! We have an amazing upcoming ARTLab program that asks: If it was completely up to you, and you could fill one of our gallery spaces with anything, what would you use? During a three hour Install Tours, visitors participate in a project called "Install Boxes." After a tour and a break for lunch, visitors receive a small box, art materials and a word such as “old,” “itchy,” or “cold,” and they create their own miniature installation within the box that reflects what they think an “old,” “itchy” or “cold” room would be like. The ArtLab program on September 6th will be an opportunity to do an install project right in the galleries. When you visit the front desk, you will become a Prospective Installation Artist, and you’ll receive a word for inspiration. During your visit you’ll discover three underutilized spaces that we’ve identified in the museum. These spaces will be an opportunity to experiment with a few materials and change the space, using the word you received as inspiration, or using your own creative ideas. Got even more ideas for the space? You can write down what other ideas you have for the space on a big piece of paper and brainstorm with other visitors. There are no right or wrong ideas - at the Mattress Factory, we want you to dream big, just like our artists! This project is meant to be a glimpse into what the installation art process is like, and what the artist residency program is like at the Mattress Factory. All artwork you see at the museum is made especially for the museum right on the spot, using whatever materials the artist wants, be it wax or hard candy or thousands of matchsticks or hundreds of skeins of yarn. 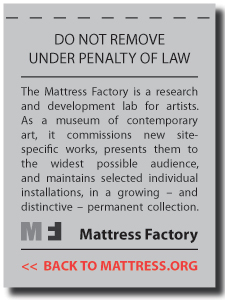 But why should your installation ideas be limited to the Mattress Factory? Do you have a space in your house, apartment, school, office or community that could have potential for an installation? Show us what your ideas are through Twitter or Facebook!